Designer Patrick Tennant’s client didn’t give him much to go on. 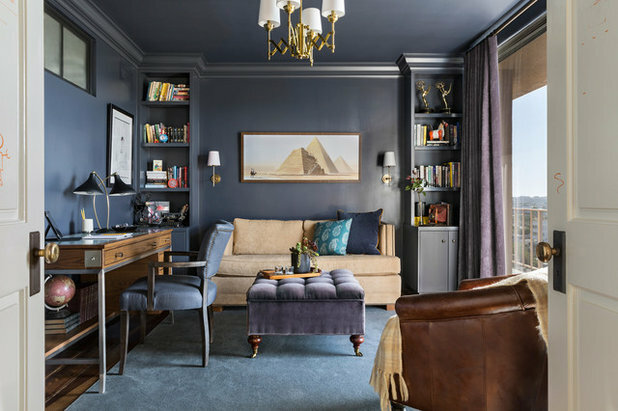 Instead, the homeowner, a television comedy writer, entrusted the designer to go with his gut and remodel the client’s condo the way Tennant would do it if it were his own home. “The client said, ‘I just want to show up and have it be gorgeous,’” Tennant says. To do that, Tennant, head of interior architecture at Tim Barber Ltd. 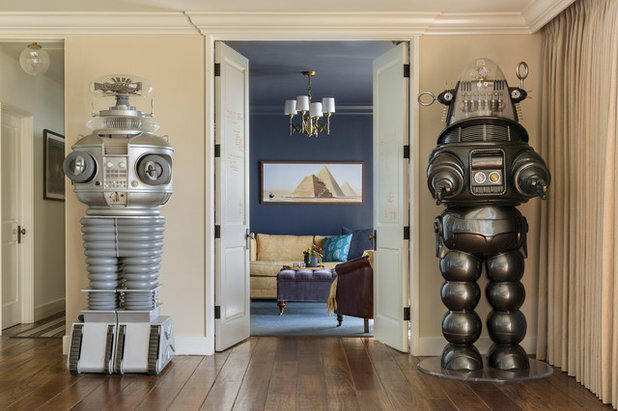 Architecture, created an open, warm and inviting space that focuses on a great view and a few attention-grabbing pieces, including two large robots, a collection of guitars and several Emmy awards. The condo sits on the penthouse floor of a former apartment building built in 1963. It features large sliding glass doors in the dining area, living room, guest room and master bedroom; the glass doors were installed in the 1970s to replace 4-by-6-foot aluminum windows — a lucky break, because regulations now forbid any changes to the exterior architecture of the building. The views stretch all the way to the ocean on clear days. In the original layout the front door opened immediately into the living room. 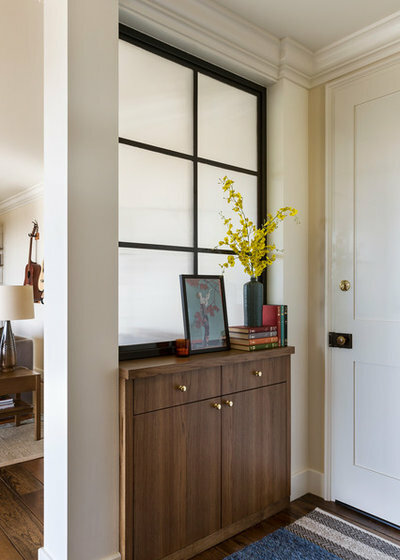 Tennant created a foyer, shown here, by adding a column and an interior window with frosted glass. A built-in cabinet with drawers stores keys and other items. The frosted, ribbed glass in the window creates a delayed reveal as you come around the corner. The mirror in the entry reflects light and is “practical, so you can check yourself before you leave the house,” Tennant says. A reading nook includes a wall sconce and a burl wood side table infused with acrylic. 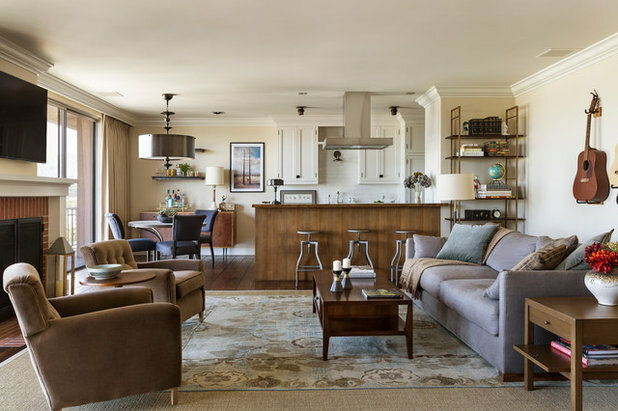 Casual club chairs and a vintage coffee table provide a midcentury modern vibe. Tennant layered a 1920s Deco-inspired rug on top of a sisal rug to “expand the footprint” of the living space. The rug’s muted colors and floral pattern soften the space. When the client entertains, he pulls in chairs from the dining table for additional seating. Tennant stained the existing poplar floors. 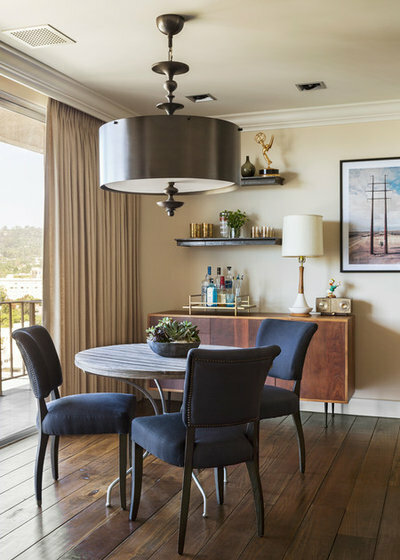 He added a light fixture that’s the same dimension as the round table underneath it, a decision made with an eye toward the future when the client gets a larger table. “I didn’t want the light to be undersized when there’s a bigger table below it,” Tennant says. 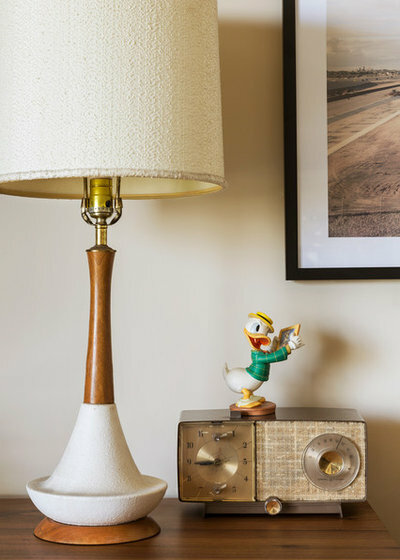 Tennant purchased the vintage lamp online and placed it atop the sideboard next to the client’s radio. “That radio and Donald Duck are a match made in heaven,” Tennant says. The door at the end of the kitchen is a service door that opens onto a common hallway in the building. 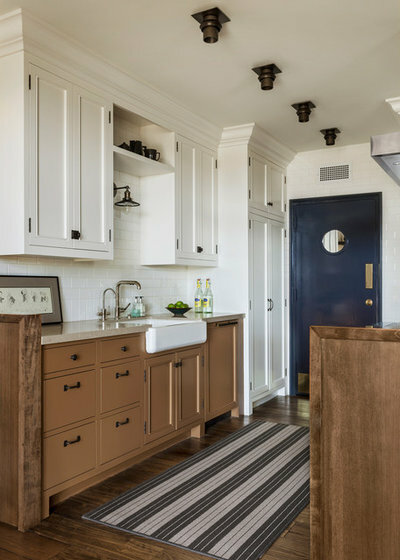 But Tennant, whose first career was in set design, dressed it up with blue paint, brass kick and push plates, and a porthole window with a mirror inside to make it feel like a kitchen door that leads to another room in the condo. “Your brain feels like the place is bigger,” he says. Originally the lower cabinets were to be finished in the same wood veneer as the bar and pony walls. But budget concerns led to a less-expensive option: paint. 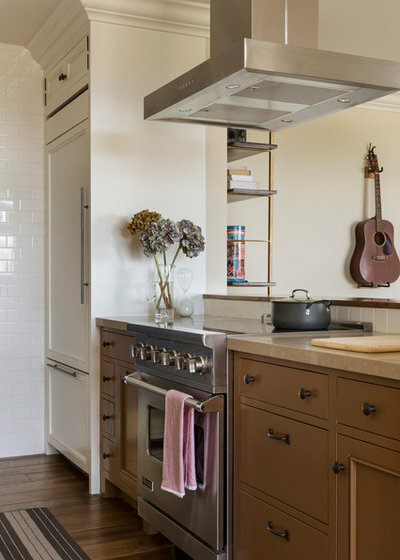 The Viking electric range came at the end of a long search for a range that looked like gas but fit into a kitchen in a building that’s all electric. The fridge is just 24 inches deep to save as much space as possible in the galley kitchen. The counter tops are engineered quartz. “It’s indestructible, and it goes with our less-traditional vibe,” Tennant says. Doors at the opposite end of the living room lead to the guest bedroom, which is also a home office and den. The sofa folds out into a queen bed for guests when needed. The doors to the office are painted with whiteboard paint; the client uses them for jotting down ideas. 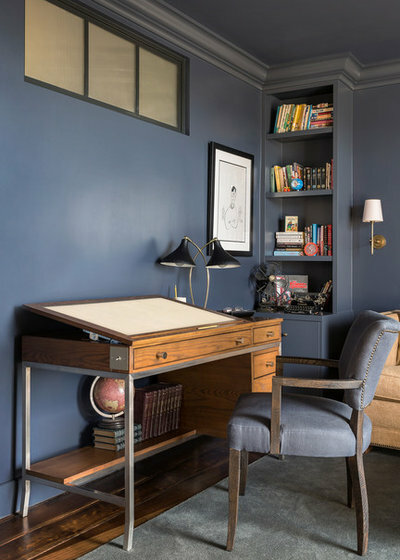 Painting everything in this room blue — walls, built-ins, molding, ceiling — made it feel “completely different from all the other rooms,” Tennant says. “It’s this little jewel at the end of a long room, and it just pulls you toward it when the doors are open.” Even the drapes are a similar shade of blue to the paint. Tennant added crown molding and a high window above the desk to bring light into the foyer on the other side of the wall. The pyramids art above the sofa is a piece of concept art for the movie Mr. Peabody and Sherman. Tennant and Barber designed the desk, which tilts up to serve as an illustration table or a drafting table. 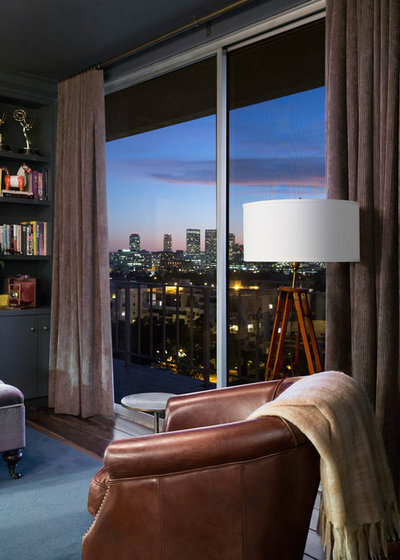 The views encompass Century City, Beverly Hills and Rodeo Drive. 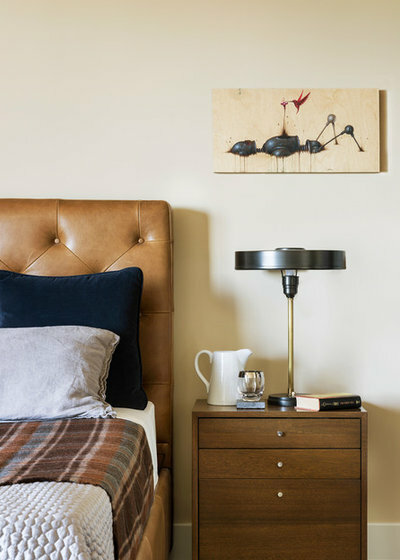 “We kept it really simple” in the master bedroom, Tennant says, with a leather headboard and a vintage 1950s bedside table. 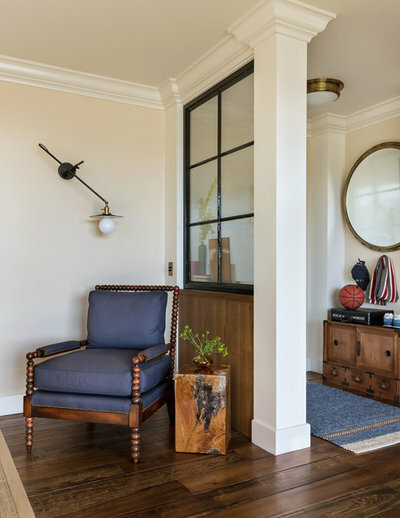 The lamp “feels midcentury but also 1920s industrial Deco,” he adds. The robot art already belonged to the client. Before the remodel, the master bathroom was defined by pink marble, brass fixtures and a huge spa tub. Tennant ripped all that out and took down the wall on one side, replacing it with a steel-and-glass side panel with a door. Now it “doesn’t feel like an interior bathroom, because it gets so much light,” Tennant says. 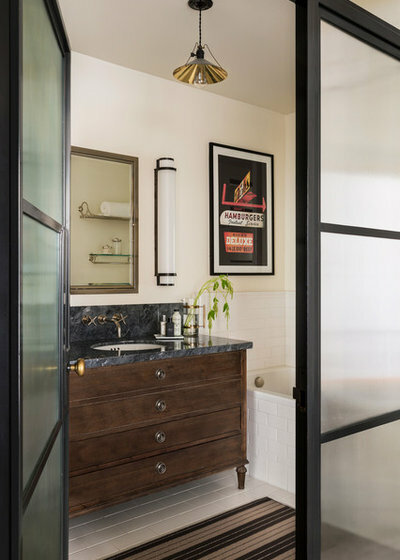 He added a deep soaker tub, classic white subway tile and a new vanity and medicine cabinet.